You want to wow your friends and family this holiday?? Here is a super simple and ridiculously flavorful appetizer to serve. Caramelized Onion & Blue Cheese Bruschetta. Whether you’re a guest at your family gathering, or hosting it…my Holiday Entertaining Guide has everything you could possibly need to help you host or be a guest at your Holiday Feast on a Budget this year! Meanwhile, slice the baguette bread, place on a baking sheet and run under the broiler for 2 to 3 minutes to toast the pieces some. Then add the “balsam-melized” onions and a few crumbles of blue cheese to each bread slice. Run under the broiler again for 1 to 2 minutes, until cheese softens. 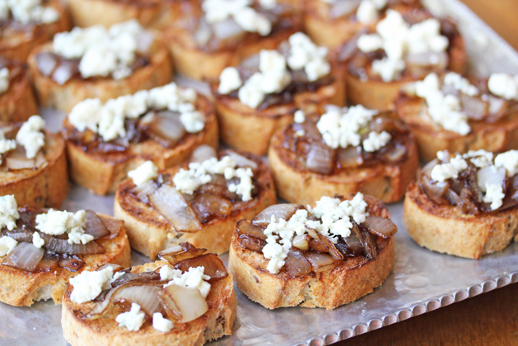 Serve Caramelized Onion and Blue Cheese Bruschetta.